The transfer of the current Operation Master could not be preformed. Solution: First check if the windows 2003 role owner is alive and you can reach that server. You can check which server holds the role “netdom query fsmo”. If that all is fine try moving the role with ntdsutil. You will get a warning message choose Yes to continue. Then type q and again q to exit ntdsutil. You can use: Transfer domain naming master, Transfer infrastructure master, Transfer PDC and Transfer RID master if you also would transfer the other FSMO roles with ntdsutil. Posted in Blog, Windows 2008 at October 31st, 2010. No Comments. It seems that changing the search accounts, creates a problem with installing SharePoint updates like SP2. So before changing the search accounts read this article! After installing a ssl certificate on a SBS 2008 server you get 2 different SharePoint Services 3 Search event errors. On your SBS, open Active Directory Users & Computers (Start –> Administrative Tools –> Active Directory Users & Computers. Within ADU&C, navigate to the Organizational Unit where you want to create the new user accounts. Enter a strong password for the new account. We do not have to worry about granting any access or permissions to the two new accounts we created. After the accounts have been created, close Active Directory Users & Computers, then open SharePoint Central Administration (Start –> Administrative Tools –> SharePoint 3.0 Central Administration). When SharePoint 3.0 Central Administration opens, go to the Operations tab. In the Action column, click the link to Stop the “Windows SharePoint Services Search” service. o You will receive a warning that stopping the search service will remove existing indices. Click OK to acknowledge the warning. When you return to the SharePoint Central Administration Operations tab, the Windows SharePoint Search Service will show as stopped. Click the link to Start the Windows SharePoint Services Search service. This will open the Search service configuration page. o. For a username, enter \SPSearch (where is your AD domain). o. For a password, enter the strong password you assigned to the SPSearch account. o. For a password, enter the strong password you assigned to the SPContent account. In the Search Database section, change the database name by appending and underscore 1 (“_1”) to the database name. o By default, the database name should be WSS_Search_[SERVERNAME], so we’re changing it to WSS_Search_[SERVERNAME]_1. o Changing the name is necessary because the default database name already exists with search data. If we attempted to use the default database name, SharePoint would throw an error that the database contains user-defined schema and cannot be used. By changing the search database name on this configuration page, SharePoint Central Administration will create a new database using this name and configure search to use this new database. Since the new database is empty, we won’t encounter any errors. Accept the remaining defaults and click the OK button. After clicking OK, the settings should be applied and you should return to the “Services on Server” page in SharePoint Central Administration, and the Windows SharePoint Services Search” service should be listed as started. Close SharePoint Central Administration and open the Services MMC (Start –> Administrative Tools –> Services). Restart the Windows SharePoint Services Search service. Verify that the Windows SharePoint Services Search service is configured to login with the SPSearch account you created. Posted in Blog, SBS 2008 at October 26th, 2010. 2 Comments. When you promote your windows member server to a domain controller the SQL Server (dbname) service won’t start anymore. Solution: This is because the SQL Server (dbname) service is started under the local system account, this doesn’t work on a domain controller. Start the service under a user account with enough rights. 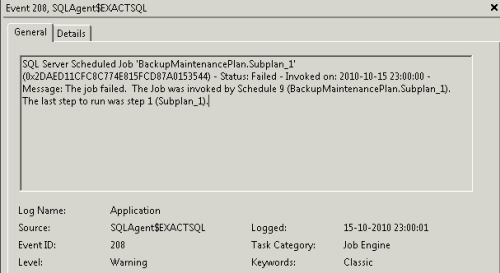 Posted in Blog, SQL 2005, SQL 2008 at October 22nd, 2010. 2 Comments. After creating a Maintenance Plan in SQL 2008 to create a backup or something. You’ll notice it hasn’t run by schedule. But if you copy the T-SQL and execute it as an query it qorks fine. When you take a look at the application event log, you will see an event id: 208 on the SQLAgent$EXACTSQL source. Solution: You have to install SQL 2008 Integration Services. Another thing which can cause a problem is when the SQL ServerAgent service isn’t started or started with wrong credentials, make sure it’s started with user credentials that has access. Posted in Blog, SQL 2008 at October 18th, 2010. No Comments. On the Exchange 2010 with the Hub Transport role installed you get several EventID 12014 errors on the MSExchangeTransport source. Solution: This error will occur when the FQDN you have entered in the send or receive connector doesn’t match with the FQDN names used at your exchange certificates. You can change the FQDN at the connector to a name available on you certificate or install a new certificate with the right FQDN name. It can also be that the SMTP service is not bind to the right certificate, in this case you can bind the SMTP service to the certificate using this FQDN. Posted in Blog, Exchange 2010 at October 14th, 2010. 2 Comments.